... is the keyboard player and one of the four vocalists of orfeas. Tony Vatousios was born in Kalloni, Lesvos in Greece. He began his music training at an early age on accordeon with the esteemed violinist the late Panayiotis Yanosis. He also performed with the community band on percussion and trumpet. His father, the late Stelios Vatousios was an educator, church cantor and mandolin player. He immigrated to the United States to attend the Berklee College of Music in Boston of which he graduated with a degree in Jazz Composition. 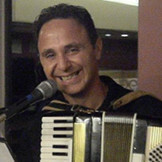 While in college he performed with many music ensembles including the Greek band Avgerinos. Upon graduation he enlisted in the United States Navy Band of which he served as a pianist and staff arranger. He performed with numerous ensembles throughout the U.S. and composed and arranged compositions that were performed in live local and nationally televised performances. While in the Navy he attended the University of Rhode Island of which he received his Masters in Music Education. Upon completion of his degree he auditioned and was accepted for the United States Band in Washington D.C. However upon discharge from the Navy he accepted a position as music teacher in Danvers Massachusetts. He has been teaching music for the past 18 years as band director and choral director in the middle school and elementary school levels. Additonally, he is the music director and cantor at St. Vasilios Greek Orthodox Church in Peabody Massachussetts of which he is responsible for all church events and numerous concerts.